March 27th – The front brake has been quite noisy in recent days, and is juddering a little, yet the pads are fine. A quick inspection in the bike shed at my destination showed the reason: The front disc it now severely worn and is starting top ripple on hard barking. The wear surface itself is about 60% of its original width. A new disc will be about £25. Time to get one ordered I think. It’s seen some life, that one. March 19th – The thaw was thankfully quick, and the day felt positively warm and sunny as aI zipped about the Black Country on errands. I was only when I got back to work and the bike started to dry out did I realise the toll the snow had taken. That bottom bracket won’t be long for the world now with all that grit. My bikes will need some real TLC when the better days arrive. 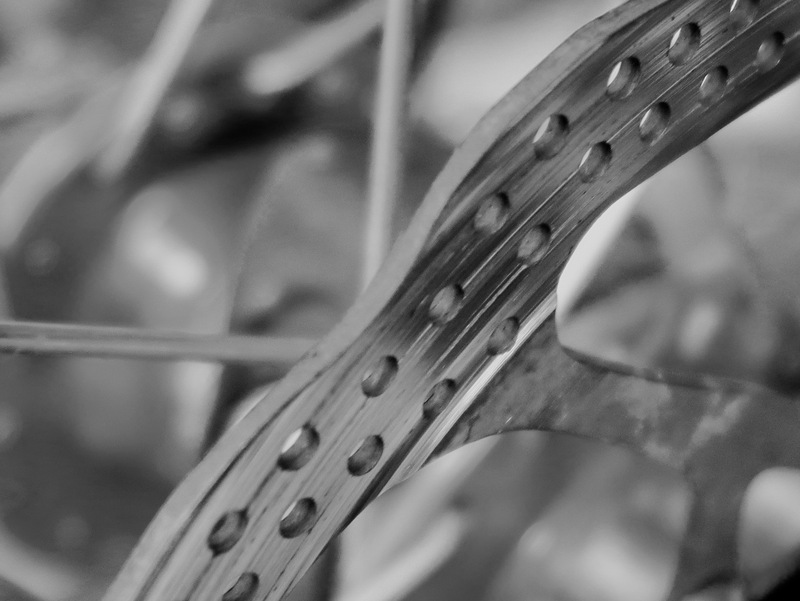 November 21st – In a familiar bike shed at a client’s premises, a neat illustration that the common or garden bicycle, whilst being a marvel of engineering in many ways, is still riddled with design conflicts and the whiff of mechanical compromise. Here, a well-used and muddy mountain bike, not a cheap one by any stretch. The lack of mud and water shielding means and mud and detritus carried on the back tyre ends up not just as a skunk-stripe on the rider’s back, but also on the front gear mechanism and transmission. In areas of hard grit like the Peak District, this continual spray works like grinding paste, gradually eating your wearing surfaces. All for the want of some shielding. Still, if you were a designer today, and proposed the derailleur system of gears – relying on forcing a flimsy roller chain between gears using side play as a conformal drag factor – you’d be laughed out of industry. Except there’s nothing much better. 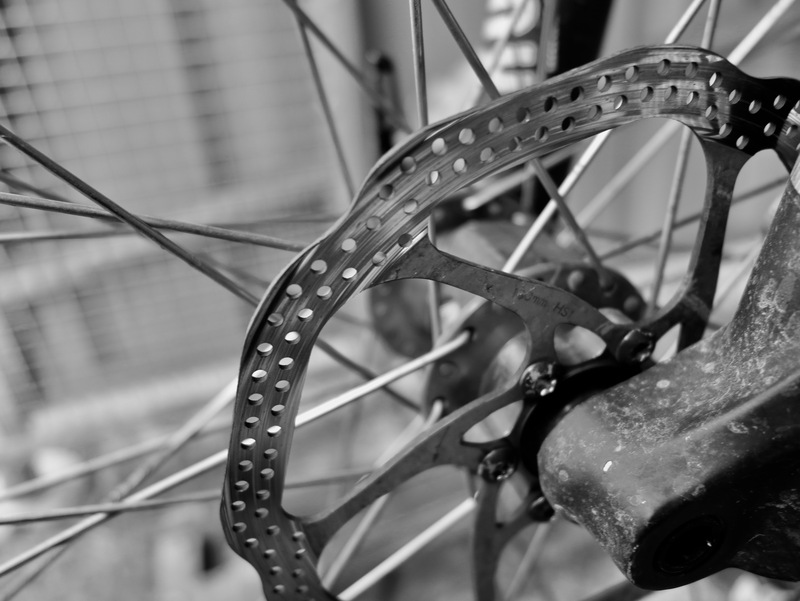 March 14th – My experiment with Specialized Armadillo tyres is now over. I will not be buying another set. On my favourite steed, I have tyre clearance issues with the mudguards, so wanting to return to the softer, more forgiving ride of a 28mm tyre over the usual 25s, last September when tyre replacement was needed, I got a pair of Specialised Armadillo tyres I’d heard were very good – apparently nearly as resilient as Martathon Plus which I normally use, at a lower profile. People ho liked them recommended them with an almost religious zeal. My initial feeling was that the tyre were not as tough, but they bedded in and proved very puncture resistant, which surprised me. My issue was that for a tyre described as ‘all condition’ their grip was sketchy at best in even moderate rain and useless on even slight ice, as two offs and various skids in the winter had proven. The compound seemed very hard and they tyres were noisy when rolling. Leaving work this evening, I flatted on the rear. examination of the tyre revealed the surface had totally delaminated from the inner lining, and was shredding. Within five months. July 11th – Today I noticed an odd little curiosity I’d not spotted before. On the canal at Clayhanger Bridge, the rope guards that were installed on the original bridge were transferred to it’s replacement in 1994. These rusting metal posts were originally at the vertices of the brickwork on the towpath side of the underbridge. Back when narrowboats were horse drawn, the guards were fitted so that the horse towropes would not groove the brickwork, but the metal instead. The years of boats passing wore deep grooves in the metal, which are a sort of historical witness to the traffic that once passed under here. There are very few horse-drawn boats now, and the posts are merely there as an artefact. I note they were fitted slightly incorrectly in that they no longer protect the corners, and their positions have been exchanged (the wear would be on the right hand side of the post in the picture) – but well done to those who rebuilt this bridge two decades ago for preserving a little bit of industrial canal history. How have I not spotted this before? April 9th – Whoops. The bike I’ve been riding over the past few days has been having an issue with the front brake pats just lightly touching the disc. 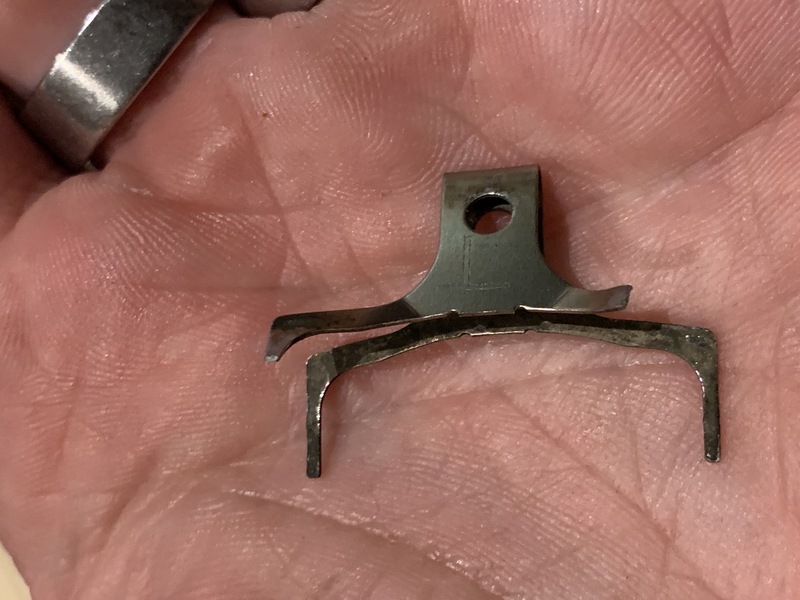 The noise was irritating me, so before I set out today, I got down to realigning the caliber, and then noticed the pads were a bit worn. Having spares on the bench, I whipped the old ones out. Oh dear. The bad set, for those not in the know, are on the left, the replacements on the right. The pad on the one side is so worn, it’s to the metal, and the spring is mashed, too. I also had an issue with the piston sticking. Hopefully that’s sorted. Hydraulic brakes wear pads quicker. I must remember that.